I am bursting at the seams to share my ultimate summer project with you today! I am probably one of the LEAST handy people I know. But then I received the Step2 Easy Turn Coupe to review. 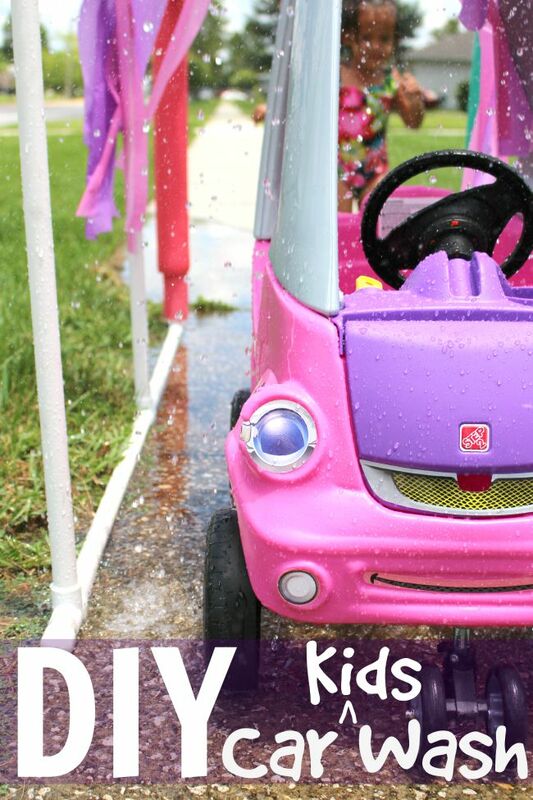 The ambitious creative side of my brain immediately screamed “DIY Kid Car Wash.” I know, crazy! 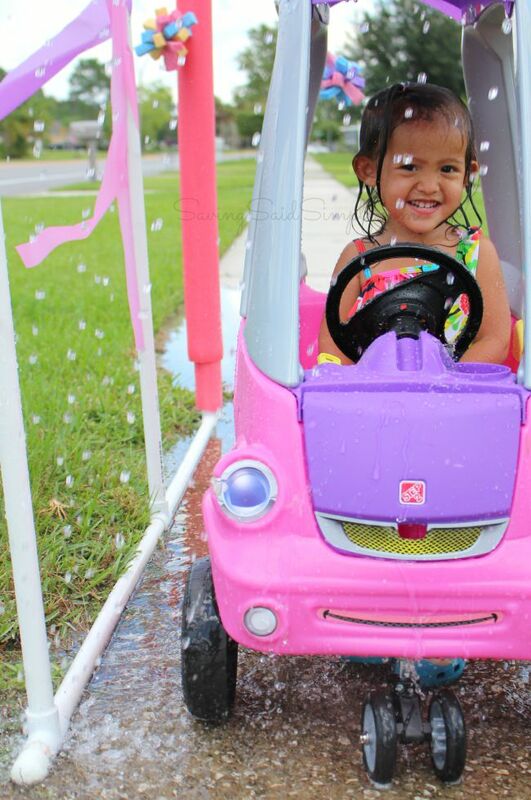 But if this mom could create this Easy Toddler Car Wash out of PVC pipe (without a man! ), then absolutely you can too. Bring on summer fun and a lifetime of giggle memories! 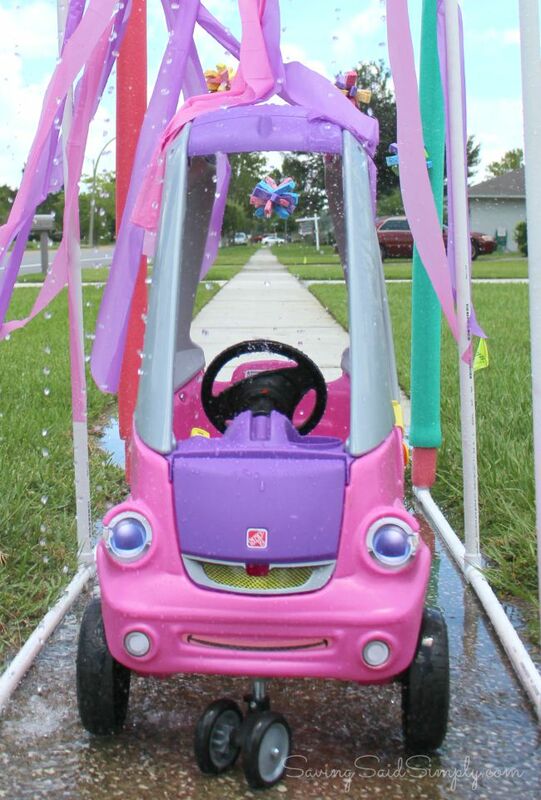 Let’s make the ULTIMATE car wash for your kids! 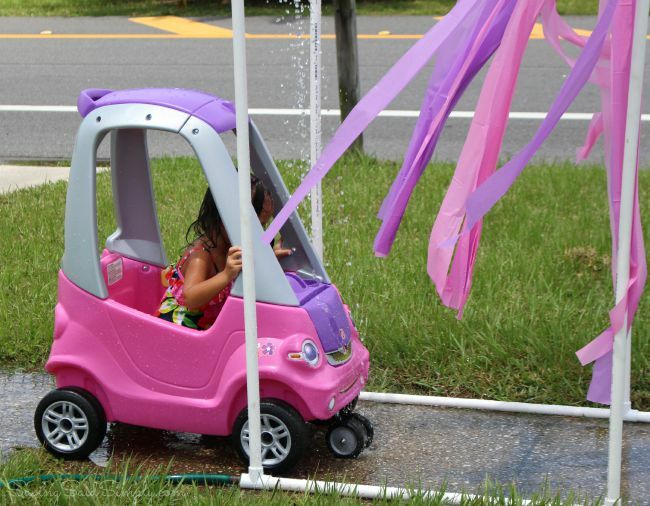 I’ve seen a few DIY Kid Car Wash tutorials online, but I must say they looked complicated. Surely we didn’t need as many pieces or steps to build one, right? 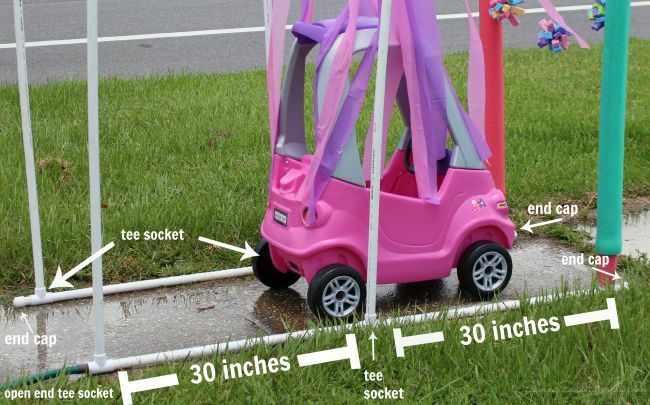 So with less than $40 and a simpler design, this DIY Toddler Car Wash was created. Moms, we can build it! 1. Put aside (6) of the 5 foot PVC piping. Using the remaining PVC pipes and the PVC cutters, measure and cut (7) 30 inch length pieces. 2. Take one of the 30 inch length pipes and draw a level line down the length of the pipe. Measure and mark an “x” for every 3 inches down the line of the pipe. Take out your drill and drill bit. Yes mom, we are going to drill! 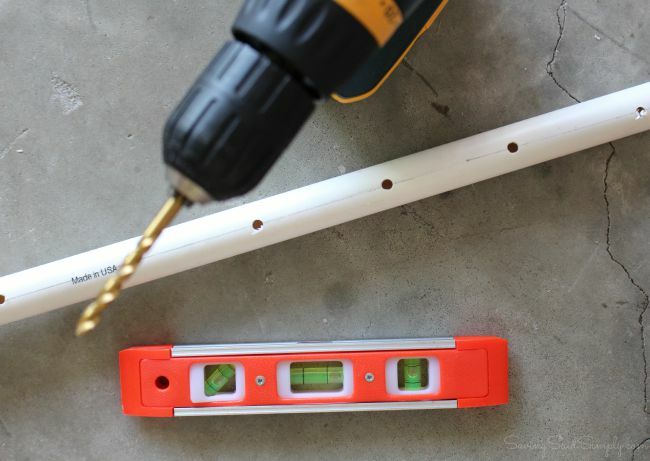 Drill a 1/4 inch hole for every “x,” about 9-10 holes. 3. 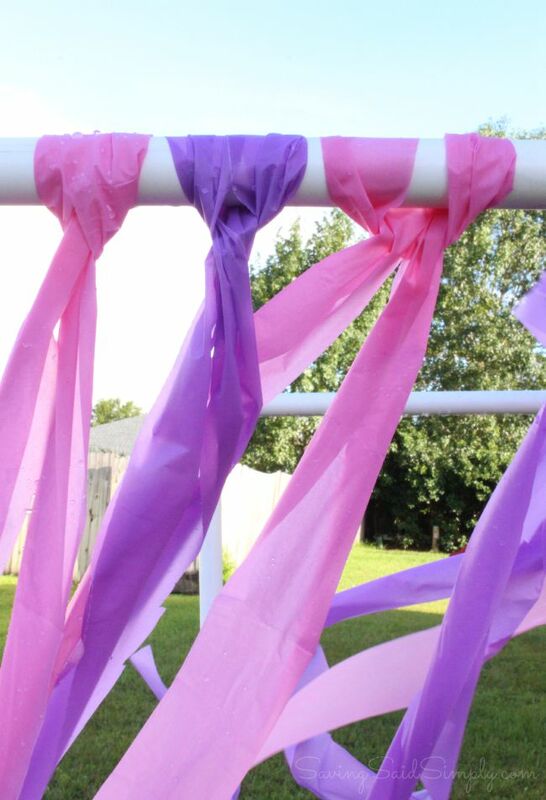 Cut your plastic table cloth into long 3-4 inch thick strips, about 108 inches in length. Take one of the 30 inch pipes and wrap the plastic tablecloth strips around the pipe as shown (just like the DIY tutu). 4. Take one of the 30 inch pieces and attach your 5 sponge balls using the fishing wire. I hung in different lengths to give more depth. 5. Take (2) of the 5 foot PVC pipes and insert into the middle of your 2 long foam pool noodles. 6. Now it’s time to assemble your pieces. Let’s start with your 3 arches. Arch #1 is your water sprinkler. Use your drilled hole pipe and cap with 2 elbow joints on the ends. Attach (2) 5 foot pieces. Arch #2 is your hanging car wash sham strips. Use your plastic tablecloth pipe and cap with 2 elbow joints on the ends. Attach (2) 5 foot pieces. Arch #3 is your sponges. Use your sponges pipe and cap with 2 elbow joints on the ends. Attach your (2) pool noodles pieces. 7. Now for the 2 bases. Assemble as shown. 8. Attach your arches to the base, ensure arch #1 (water sprinkler) is attached to the open end tee socket. Now be sure that every joint is tightly together. I only used manual force to ensure the pieces were tight. No rubber mallet or PVC glue required. 9. Attach your garden hose to the open end of the 3/4 inch Tee Socket. Secure as best you can. Turn on the water (not full blast, but just enough pressure to get the water to come out of the top of all 10 holes of your car wash). 10. HAVE FUN! With a simple design and less pieces, we were up and running in a couple of hours. The best part? When the fun is done, you can EASILY break down the pieces and store for another fun water play day! Now for the fun part. It’s driving time! 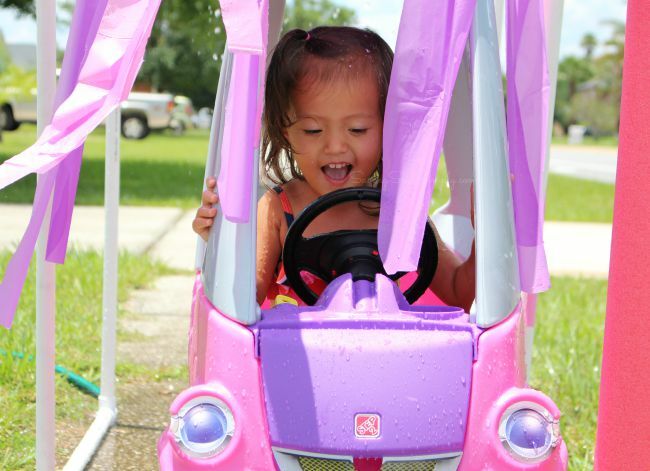 Have your child hop into their wheels for a quick car wash and cool off! We are LOVING the Step2 Easy Turn Coupe for our toddler car driving these days. Can we say stylish and FUN? Check out these amazing features! Removable floorboard – grows with your child from push buggy to kid-powered! 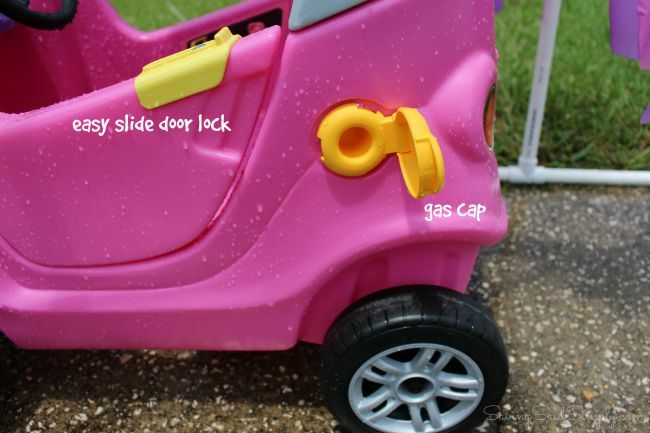 Open and close car door with easy slide door lock – LOVE this feature! Quality Step2 plastic in bright kid-friendly colors! Seriously, I’m kind of jealous of this car. I mean, my girl has better car features than I do. Look at the girly awesomeness! And she just ADORES driving around the neighborhood in it. Beep, beep! Dirty car this summer? No problem! 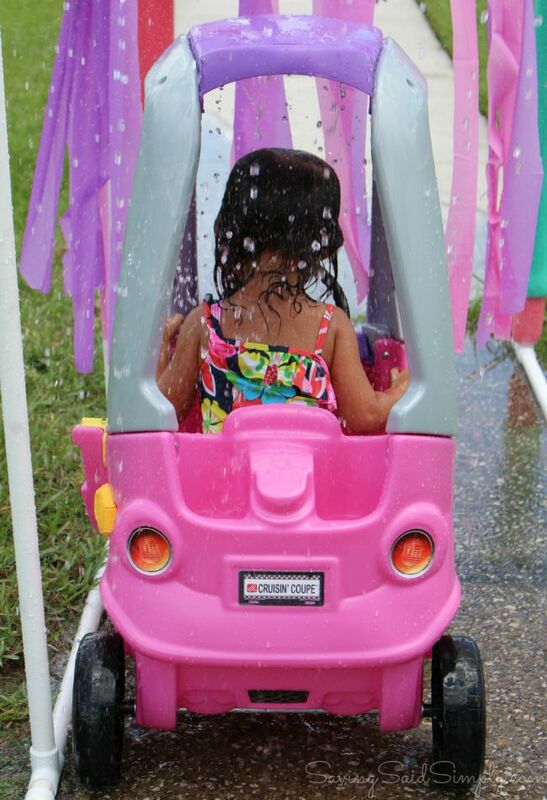 The Step2 Easy Turn Coupe easily gets a wash down through our DIY Toddler Car Wash! 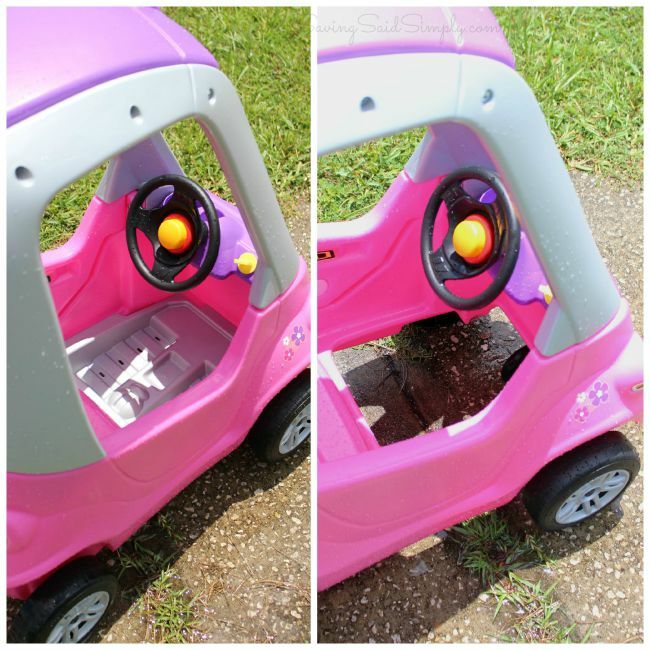 Your child’s car will be sparkly clean in no time! Just drive through! 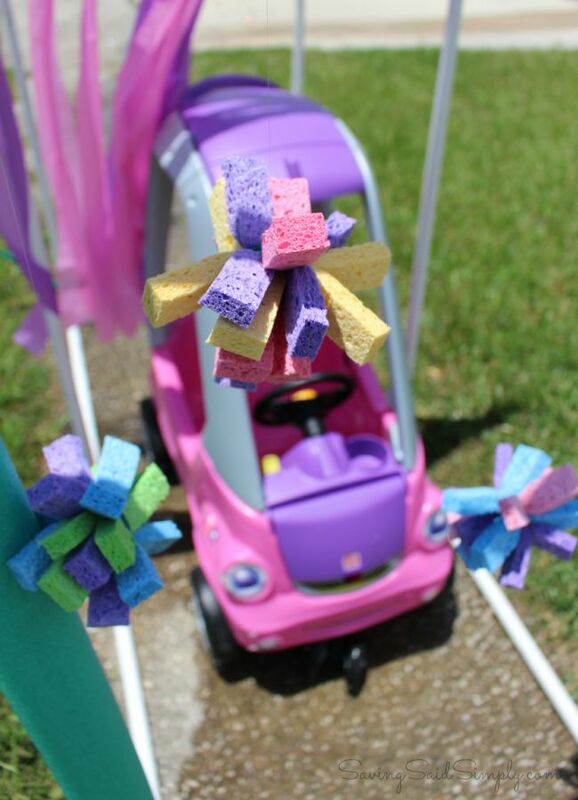 Check out our new DIY Kids Car Wash up close and in action with our fun video! Love the Step2 Easy Turn Coupe as much as we do? You can pick one up at Step2.com in the adorable pink color or a rad green color for the MSRP of $69.99. I’m so glad this amazing vehicle inspired a little summer crafting inspiration! Be sure to follow Step2 via Facebook, Twitter, Pinterest, Instagram, Google+ and YouTube for new products (fall 2015 line coming out soon! ), contests, product testing opportunities and MORE! With smiles like these, how can you resist a little summer water play? 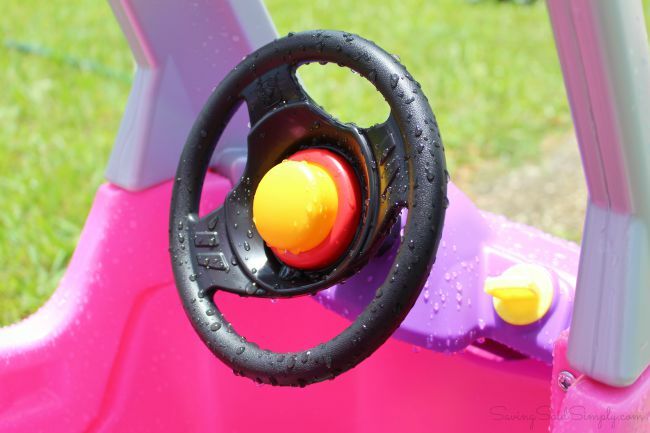 Water, giggles and fun all come together this summer with a toddler car and a little imagination. 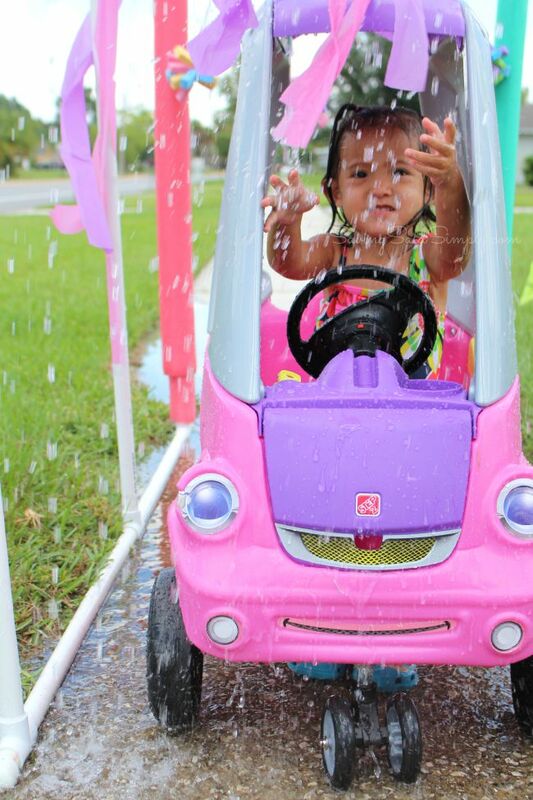 We are LOVING our new DIY Kid Car Wash! Looking for more FUN kids summer activities? Check out these favorites! 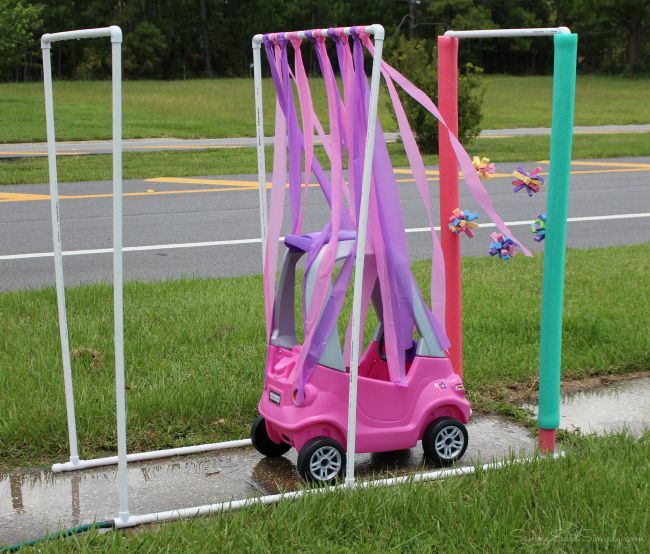 How would your kids enjoy this DIY Kid Car Wash? I am proud to be a Step2 Ambassador for 2015! I receive free products and compensation in exchange for this post. But as always, I only share what I love! All opinions are my own. Be sure to follow Raising Whasians via Facebook, Twitter, Google, Instagram, Pinterest and YouTube for fun kids craft ideas, free printables, and more. Need some more fun water play ideas? That is such a cute idea! I wish I’d thought to do something like this when my kids still had their little cars. This is such a cute project. This is perfect for hot days for the little ones. That is the cutest idea ever! My kids had a car just like that and they always sprayed it with the water hose to wash it. That is such an adorable idea! No doubt kids would have tons of fun with that. So sweet! i love that you color coordinated with your cozy coupe for the washing parts! I can’t get over how fun this looks! We have two Cozy Coupes and we totally need a car wash! What a fun idea… and loved your great directions and fabulous photos! Wish our kids were young enough to still be able to fit in their cars. We loved those! What a fun way to get the kids to cool off while they ride in their Easy Turn Coupe. That is so cool. Love the car wash. This is so adorable! She looks like she is having such a blast. This is such a fun and cute idea. What a great way to cool off in the summer. Oh this is so cute! What an awesome way to have fun with the coupe! This is adorable! My granddaughter always wants to go through the car wash. This would be perfect! She would get to go through the car wash and cool off on these hot days of summer. 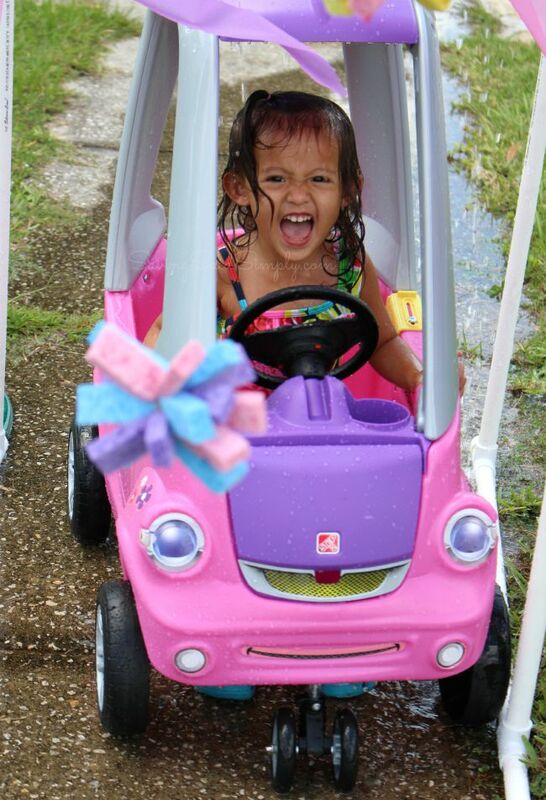 I don’t know what’s cuter: the car wash, the coupe, or her sweet little glee-filled face! I think I could probably manage this diy project. What a cute idea! 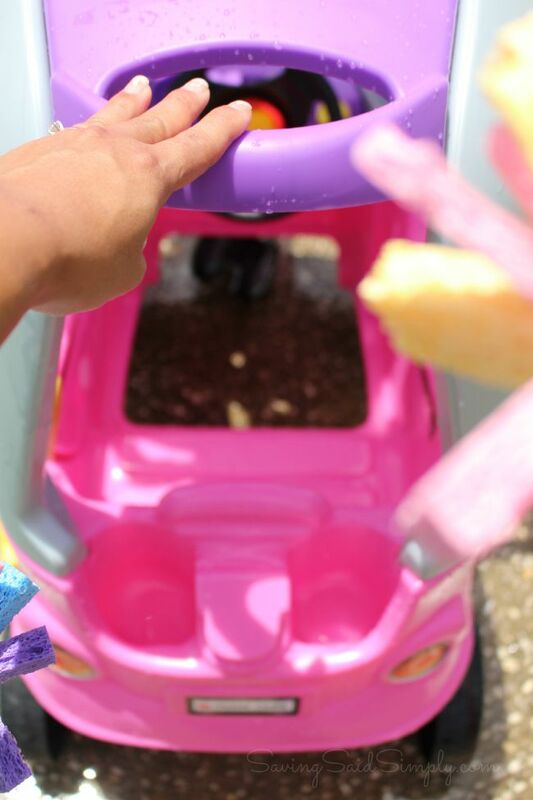 My kids love watching our car go through the car wash, so they would have a blast with the toy version! 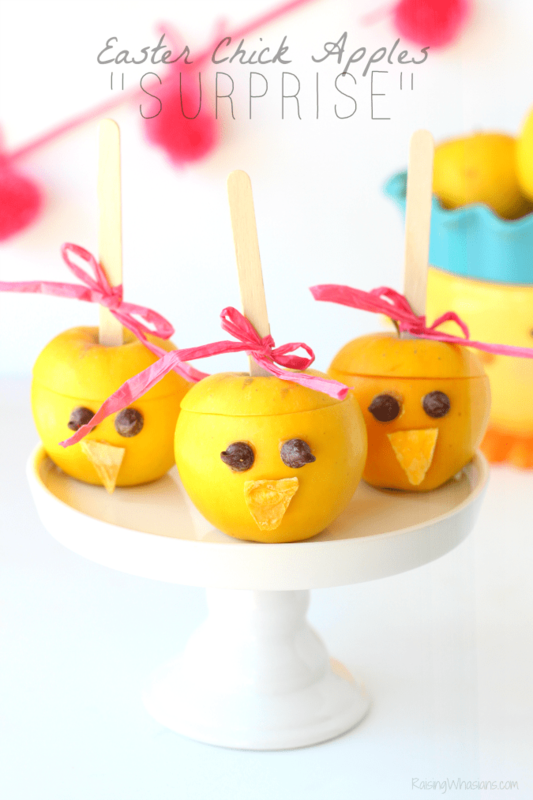 What a fun idea and this looks easy to make. Looks like a fun way to play with your kids. My kids would enjoy a car wash.
Oh how fun. My two youngest would think this is the best thing ever. I would love to do this for them! Oh My Wow this is the most innovative kids project I ever seen! 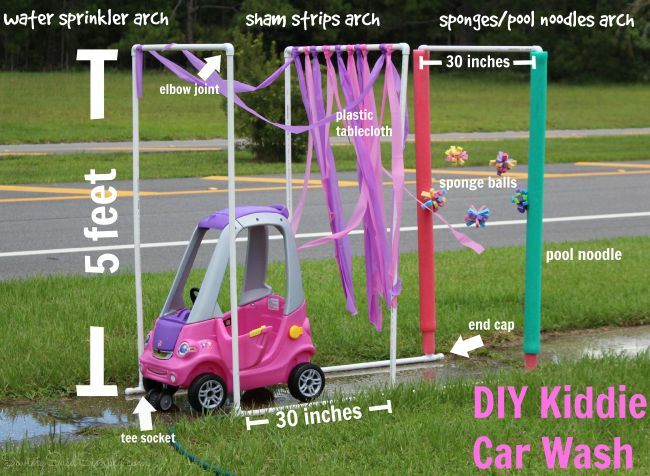 I pinned this for future references because I want my future kids to be in a DIY carwash!! Too cool love it! Oh my, this is too adorable for words. We will definitely have to try this! Now this is the cutest thing I have ever seen! Oh the things you can come up with using PVC Pipes!! Love the idea! I have to build this for my neice, she would enjoy it. That is so adorable! What a fun summer activity for kids. So much fun! I think you win mom of the year award for this car wash! This is cute, it’s definitely something every toddler would enjoy. Thank you for sharing this review. i adore this! what a cute idea for summer. I had no idea Step2 made little cars. What a fun idea! Thank you for sharing this! What a cute idea! Your little one looks like she loves it!! What a fun car wash you made. Your daughter looks like she’s loving it. This is awesome!! I’ve got to try it!! 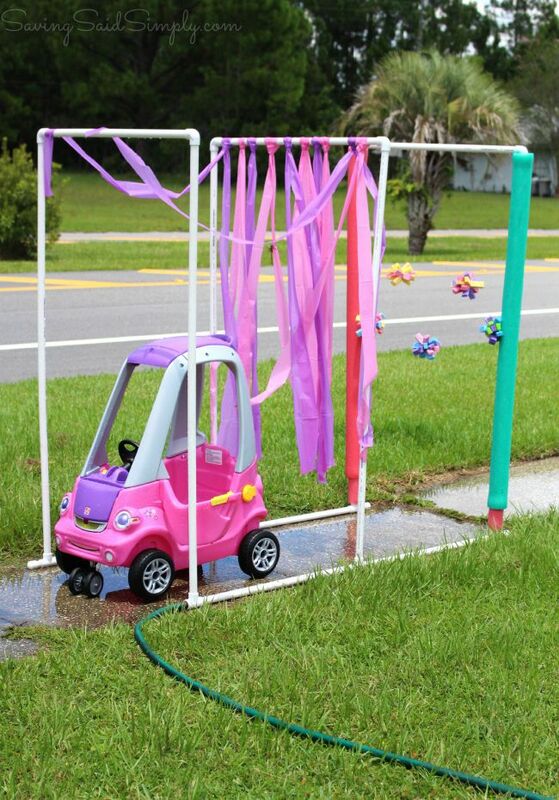 This is a cute kiddie car wash. It is a fun way to cool off in warm weather.